Hello and welcome! This topic is very near and dear to my heart. It’s important for us, as parents, to teach our children about money – earning, saving and spending. However, she recently told us that when she runs out of money, “I’ll just ask my husband for more!” Not exactly what we have been trying to teach her. We knew we needed to up our game. I grew up with parents that urged me to get an education and earn for myself. And then if I am able to stay at home some point later on — then great. I want my daughter to do the same. I’ve put together a list of my top ten ways to keep the money discussion going. And help our children build a really solid foundation. When my daughter was very little, we didn’t have a ton of money. So as she got older and both my husband and I built our careers, we had more money to spend. We’d buy her more during trips to the store because we could. We soon learned that we needed to pull back on that habit as she would expect something EVERY time we went shopping. We knew things needed to change! We started to encourage her to earn money around the house so she could see the value of money. And see how much work goes into each purchase. I’m not a fan of giving an allowance, so we started a chore board. We still buy her the necessities and fun things on special days. However, we try to encourage her to save money to buy what she wants. Or put items on her birthday or Christmas list. 1. Create a chore board. 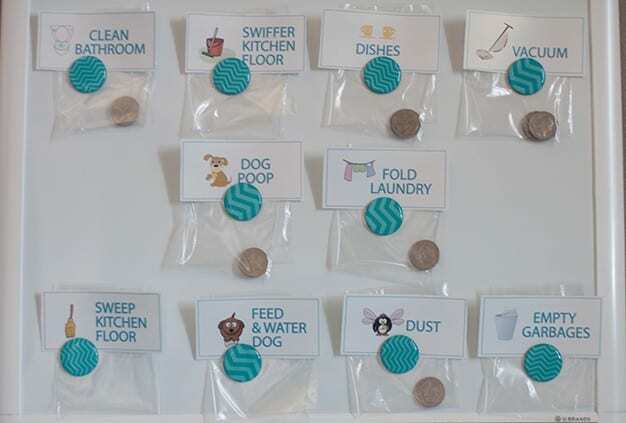 We’ve developed a chore board with a card for each chore + money associated with each. If the bag is empty, it doesn’t need to be done yet. I think a good age to start this is 5 or 6. But you can adapt the chores to fit the age of the child. 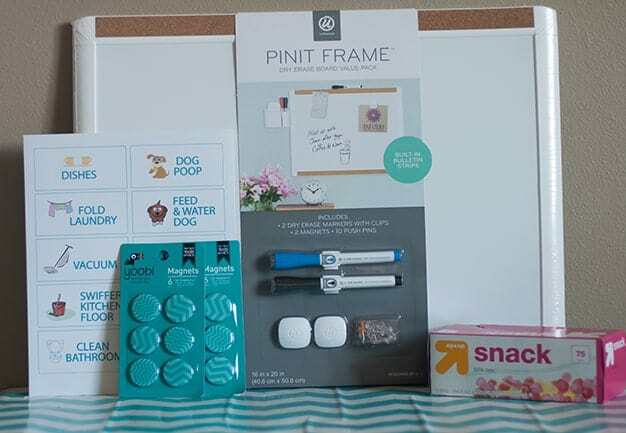 Print and cut out the chore cards, add money to the snack bags (if needed), and attach to the whiteboard with a magnet. Simple! 2. Teach them about business. This is one of my favorites. We all have an entrepreneurial side. It’s fun to teach kids a little bit about business. Let them know it’s possible to be their own boss someday! 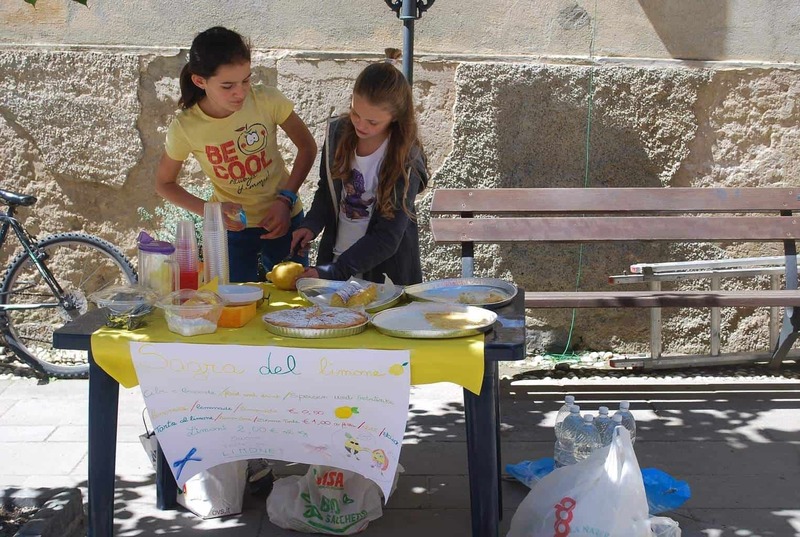 Pick a day (or multiple days) in the summer to have a lemonade and baked goods stand. 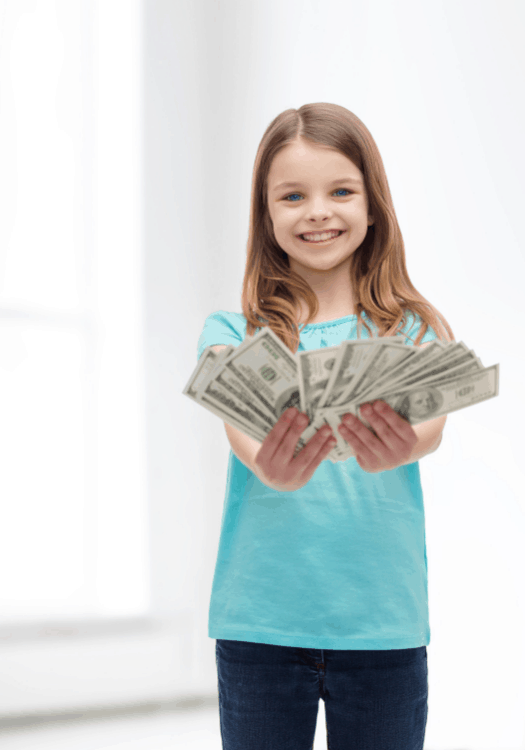 Explain to your child the expenses involved – signs, supplies, lemonade, and baking ingredients. Together, set pricing for each item based on cost. Then explain how many sales it will take to break-even. Celebrate the moment they achieve it. And then talk about profit. How much did they make after expenses are covered? Show them how to add-on sales by offering extras. For example, a brownie with the lemonade. Or maybe a fun paper straw to go with the lemonade for an extra $0.25. Update from June 4th – we did a lemonade stand this past week. And I wanted to provide a “reality” update. 🙂 Sometimes you can start the discussion about business, counting change and talking about costs. But it really is all about the fun. And we gave plenty of lemonade to kids that didn’t have their parents with/didn’t have any money with. Many other kids from the neighborhood joined in. They also sold rubber band bracelets they had made. It was a lot of fun and I’m sure they will remember it for a very long time. Other ideas – help them make jewelry or crafts and show them how to sell online or at a craft fair. If your child is a little older, they can start their own side business. Mowing lawns, babysitting, pet sitting and more. 3. Start saving when they’re babies. If you’re planning the baby shower for a relative or friend, display a piggy bank and have guests add any spare change. Another idea is to give a piggy bank as a welcome baby gift. If the baby has siblings, give one to their sibling as well. 4. Together, designate a place for saving money and a place for spending money. Designate a piggy bank that is for savings only. No draws out of that piggy bank allowed! Yet anyway. Have a wallet or a special piggy bank to put spending money in. You can even encourage the 50/50 rule. Save 50% of the money they earn and receive. And the other 50% can be for “fun” money. My daughter’s new favorite for her spend fund is the digital counter piggy bank. She is tracking her money until she has enough for the Barbie she wants. 5. Start a college fund for them. You can start a college fund for your child as soon as they are born. Or if you are a grandparent, you can start one for your grandchild! I recommend doing your research and talking to your financial advisor about the best college fund option for you and your child (children). And make sure to discuss what types of fees are involved. For example, enrollment, administrative and maintenance fees. There are other options: Roth IRA, UGMA/UTMA and more. Compare plans here: Compare savings plans – by Saving for College. Whichever option you choose, it’s really convenient to set up an automatic withdrawal from your account. It can be monthly or quarterly. 6. Start a retirement account for them. Financial advisors will tell you to make sure you are on the right track with your retirement savings before saving for your kid’s college education or retirement. Which I think is really good advice! Your kids will have more years to earn than you do. Again, before you choose the type of account, research and talk to your financial advisor to find the best option for you. My parents started a Roth IRA for my sisters and me when we were in high school. We plan to start one for our kids around the same time. This is a good opportunity to talk to your kids about the importance of saving for retirement. 7. Encourage them to spend wisely. I’ve touched on this a little already. We stopped buying something for my daughter every time we went to the store. And started to ask her to save the money or put it on her wish list. You can also talk to your kids about finding good deals, using coupons and not always buying name brand. Another big one is going out to restaurants. Our family is still working on cutting back on eating out. It can save so much money! 8. Help them open and manage a checking account. 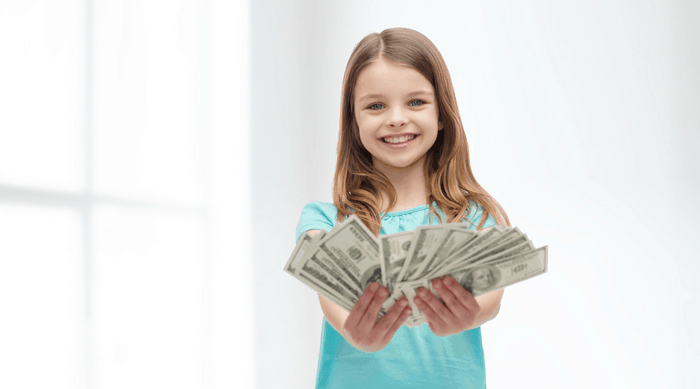 Help your child open a checking account (at an appropriate age of course). Teach them how to use the bank register. Track the deposits and withdrawals. And reconcile to each monthly bank statement. 9. Talk to them about credit cards. I have a feeling this will be a controversial topic. But I think it’s important to talk to our kids about credit cards. They can be a good tool. Credit cards don’t have to be bad! You can recommend they open a credit card when they are of age. Encourage them to use it for day-to-day expenses. Paying off the balance each month. This can help them build their credit score. It can also be a great lead-in to talk about interest rates. Find a credit card with great rewards – cash back, hotel points or miles. 10. Help them develop a personal finance forecast. If you haven’t already, check out my recent post Develop a Personal Financial Forecast. We can teach our kids (maybe closer to teenage or young adults) to create a financial forecast too. Planning for income, expenses and incorporating savings into a forward-looking financial plan can be a very powerful tool! These are all great ideas! My husband and I also started introducing the concept of money to our boys at a young age. We felt that it is important for them to know that things just don’t magically appear and that Daddy has to go to work so we have money to buy the things we need and want. My favorite tip you suggested was number one. I love how you put the money right in the lunch baggies so they could see exactly what they would earn. Glad you like number one. It is a little extra motivation to see what they’ll earn.